President Buhari has just delivered his speech at the 72nd UN General Assembly in New York today. He stressed on the need for member states' cooperation during these 'dark and troubled times' and assured everyone of Nigeria's cooperation in this pursuit, He then commended the UN's role in settling civilians in conflicted areas of Syria, Iran and Afghanistan and thanked the governments of Germany, Italy, Turkey and Greece assisting refugees. “In an exemplary show of solidarity, the international community came together within my own region to assist the countries and communities in the Sahel and the Lake Chad regions to contain the threats posed by Al Qaida and Boko Haram,” he said on Monday. "We thank the Security Council for visiting the countries of the Lake Chad Basin to assess the security situation and humanitarian needs, and for pledging assistance to rebuild lives and livelihoods." He added that international community came together to focus on gender equality, youth empowerment, social inclusion, and the promotion of education, creativity and innovation. And more importantly, free and fair elections, and "enthronement of the rule of law are expanding everywhere, especially in Africa." But the cooperative efforts should be sustained, he mentioned. "We must collectively devise strategies and mobilise the required responses to stop fleeing ISIS fighters from mutating and infiltrating into the Sahel and the Lake Chad Basin, where there are insufficient resources and response capacity is weak. This will require strong UN cooperation with regional organisations, such as the African Union, in conflict prevention and management." Buhari also spoke about the humanitarian crisis in Yemen and Myanmar, linking it to other incidents in the pst. "The Myanmar crisis is very reminiscent of what happened in Bosnia in 1995 and in Rwanda in 1994," he said. "The international community cannot remain silent and not condemn the horrendous suffering caused by what, from all indications is a state-backed programme of brutal depopulation of the Rohingya inhabited areas in Myanmar on the bases of ethnicity and religion." He then moved on to North Korea. "The most pressing threat to international peace and security today is the accelerated nuclear weapons development programme by North Korea. Since the Cuban missile crisis of 1962, we have never come so close to the threat of nuclear war as we have now," he added. "All necessary pressure and diplomatic efforts must be brought to bear on North Korea to accept a peaceful resolution of the crisis." He proposed a UN delegation to urgently "engage the North Korean leader." 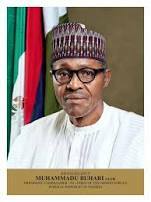 Buhari concluded his speech by reiterating Nigeria’s commitment to the principles and the vision of the United Nations. "Since our admission as a member state in 1960, we have always participated in all efforts to bring about global peace, security and development. Nigeria will continue to support the UN in all its efforts, including the attainment of the 2030 Agenda for Sustainable Development."